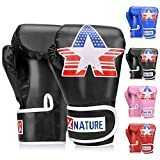 So, you are looking to get yourself or your son/daughter/student or close one a pair of high quality boxing gloves but are unsure of the best size/weight for their age. Use our handy tool below by selecting the age you are looking to buy for and find the sizing information most widely recommended. We have also added our top recommended pair of gloves for each age for your convenience! As there are boxing gloves for would be fighters as young as 3 years old, this is where we will start. What size/weight boxing gloves for 3 year old? At 3 years old, your child will need boxing gloves weighing just 2 ounces (2 Oz). This is the lightest size gloves you can buy. They should not be hitting anything but soft surfaces and don’t yet have the strength to generate a great deal of power, so the gloves need less padding and as such can weigh less. Which 2 Oz gloves to buy your 3 year old will be your next thought and we recommend purchasing the ones below for maximum effect. Yes, they really make boxing gloves for children as young as 3 years old! Now, I would never suggest you have your young child take part in any defensive practise or combat sport at this age. They are still growing and developing and hits to the head (or anywhere for that matter) must be avoided at all costs. Having said that, you may want to get them started practising combinations and correct punching techniques early if they express an interest in doing so and enjoy the time spent learning. 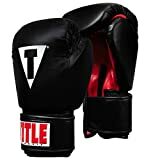 What size/weight boxing gloves for 4 year old? For a 4 year old, you will want to stick with gloves weighing between 2 Oz and 4 Oz. You should either go with the option above or you could get the slightly lower priced pair below. How big your child is for their age will dictate whether you should select the 2 Oz or the 4 Oz gloves. Any contact training should be avoided when teaching a 4 year old boxing. Simple pad and bag work alongside training on how to deliver an effective punch can start developing discipline and confidence in your child at this age though. The benefits of starting boxing at a young age should not be overlooked but of course their health and safety should always be the top priority. Getting them proper gloves is a huge part of this and also a general good habit to get them in from a young age. What size/weight boxing gloves for 5 year old? At 5 years old, your child will benefit the most from using 4 Oz gloves. You should use your judgement to determine if they are big enough to move up to 6 ounce gloves by looking at the size of their hands and considering their upper body strength. If you go for the lighter weight ones, it is likely you will need to replace them with slightly heavier ones within a few months or up to a year later as your son, daughter, student or loved one grows. See which size boxing gloves for 5 year olds we recommend below. As they progress just out of their toddler years, a 5 year old will be growing fast and getting ever stronger. They are likely to be showing a keener interest in any activity which takes more energy and offers some old fashioned fun. This is why boxing can be a great idea to help them expend all of that excess energy. It may also make getting them asleep at bed time a little easier. 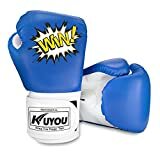 What size/weight boxing gloves for 6 year old? When buying boxing gloves for a 6 year old, you should look to purchase 6 ounce (6 Oz) ones. At this age you can be confident selecting a slightly heavier pair than the lightest weight ones and going for a pair which your son or daughter can grow into. 6 ounce gloves will be on the lighter side as a young 6 year old fighter progresses through the year. They may start to generate more power especially considering the lighter weight of the gloves and should also start seeing speed and accuracy improvements. They are entering the ages where they can start experimenting in their training sessions a bit more and really start finding their own fighting style and they need the right kids boxing gloves to do so effectively. What size/weight boxing gloves for 7 year old? A 7 year old boxer will most likely need a slightly heavier pair of gloves which can last them as their fighting skills progress. 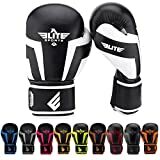 You will want to start by looking at 6 Oz boxing gloves for 7 year olds but if you are buying for someone who has grown out a bit more, you may even consider going up to an 8 Oz size/weight. Elite Sports makes fantastic quality products which is why it is recommended above and the glowing customer reviews is a testament to just that. Price is of course important especially considering you may be replacing the gloves should your child go through a rapid growth spurt but this should never mean you compromise on quality. Your son or daughters safety will no doubt be a huge concern so only buy the best for them! What size/weight boxing gloves for 8 year old? A good rule of thumb when it comes to boxing gloves for 8 years old is to stick with between 8 ounce (8 Oz) and 10 ounce (10 Oz) gloves. They offer a bit more weight and allows the child to start developing some more arm and upper body strength. It is likely they will also start trying some very light sparring or defensive moves around this age so thicker padding on the gloves (and a bigger size as a result) will be more important. These sizes are entering the adult range of weights. As they (the younger fighters) start start participating in more hands on and intense training sessions, thicker gloves which offer better protection to both the fighter and their opponent will be vital. This is to minimise the risk of injury to both parties. It is likely they are making other friends in their training glasses and having a good looking pair of gloves (like the ones above) will make them better fit in and enjoy the sport that much more. What size/weight boxing gloves for 9 year old? 9 years old, still young and full of wonder and looking to develop their fighting style. It is likely that their punching are getting harder and faster now and that they are developing keen reflexes. 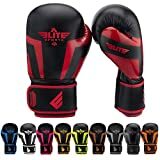 If you find yourself asking what size and/or weight boxing gloves to get for a 9 year old, now is most likely the time they can move up to 12 ounce (12 Oz) boxing gloves. It is likely that it will be all about who has the coolest pair of gloves at this age. Kids are developing their competitive spirit and with a pair of Venum gloves like the above, they will be having the best time in their training sessions. Whichever gloves you decide to order, make sure that they look the part as well as act it. Anything you can do to foster the discipline and determination that boxing can in still will be appreciated in the long run by your child. What size/weight boxing gloves for 10 year old? Stick to the 12 Oz boxing gloves for 10 year olds. By now they will have more than enough strength to keep their stance with a pair of slightly heavier gloves and will benefit greatly from the extra padding and protection offered by ones weighing this much. Maybe they start training more regularly at this age. At 10 they will likely have more endurance and be ready to up the level of their training sessions again. 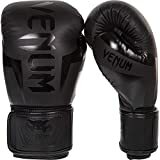 Fast combinations, heavy hits and quick reflexes is what they will be after and the right pair of training gloves will allow them to find this. What size/weight boxing gloves for 11 year old? You wont struggle to find a training class for your 11 year old and you will want to send them with the right size boxing gloves for 11 years old. This can depend on the size of your 11 year olds hands but it will usually be between 12 Oz – 14 Oz. Boxing practise at 11 years old can be great for building strength, confidence and character. Getting them started young means they can more easily pick up good habits and proper form/technique. It is also a great way for them to learn how to handle stress and let out some pent up energy. What size/weight boxing gloves for 12 year old? If your son/daughter has been training since they were young, it is likely they will have a little more upper body strength by now. 12 ounce (12 Oz) boxing gloves is the weight best for 12 year olds. This size offers protection and durability that should last a fighter at least a year of regular training. You may have to prepare yourself for the fact that as a child enters the teenage years, you may find yourself upgrading and replacing their training equipment more often. Growth spurts and more intense workouts can mean the amount you spend kitting your son or daughter out for their sporting hobbies can increase. What size/weight boxing gloves for 13 year old? Stick to the 12 Oz boxing gloves for a 13 year old. As the shape and size of a child this age can vary, I would recommend having them try on whichever gloves you end up purchasing before sending them to the local boxing gym with them. Entering their teenage years, the sport really begins to increase in intensity. Thicker 12 Oz gloves are needed to offer adequate protection and maximum performance. Everlast is a premium brand which offers superb quality. The Everlast research, design and product development helps boxers all round the world improve their speed, power and technique. What size/weight boxing gloves for 14 year old? Asking yourself ‘what size boxing gloves for 14 year old’? Stick to 12 Oz gloves. You should consider your son or daughters (or your) height and weight. If you have a larger frame and are a bit heavier, you can go with a heavier pair of gloves. Lighter and/or slimmer? Go for a lower weight pair of gloves. When buying boxing gloves for a 14 year old, you should look for padded ones which feature a velcro locking mechanism. This will allow a fighter to secure the gloves in place which means they can offer adequate support, protection and shock absorbance.